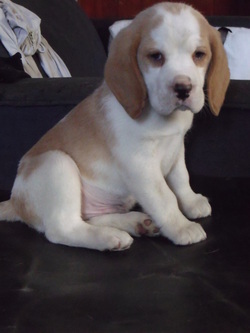 Bagel is a lovely Tan and White boy with the temprement to die for. 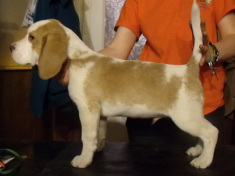 We waited a long time for the perfect tan and white beagle to come along and we got him. Bagel is a joy to live with and is such a sweetie. He is so laid back he's horizontal! Unfortunatly...after Bagel fell asleep in the show ring!!!! !...we have retired him from showing very early. However he is still available for Stud duties and will pass his beautiful comformation on to his progeny.